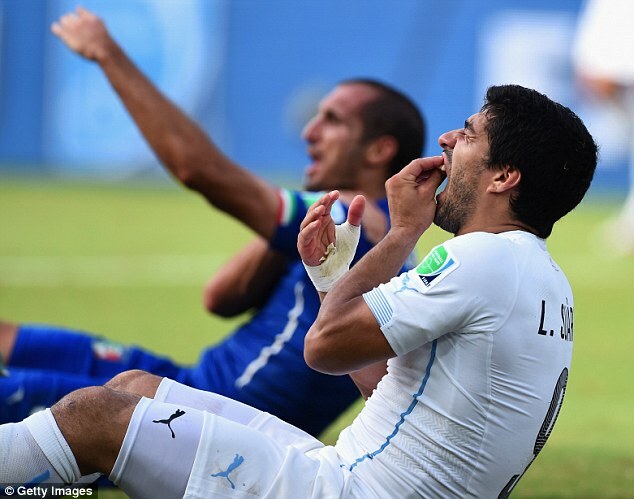 Disgraced Uruguay striker Luis Suarez has apologised to Italy defender Giorgio Chiellini for the bite that earned him a nine-match and four-month ban from football. Suarez was suspended from all football for Chiellini in when Uruguay played Italy in the ongoing FIFA world cup in Brazil. The Liverpool striker apologised in a statement on his personal website, which was then Tweeted by Suarez, he wrote: 'After several days of being home with my family, I have had the opportunity to regain my calm and reflect about the reality of what occurred during the Italy-Uruguay match on June 24, 2014. 'Independent from the fallout and the contradicting declarations that have surfaced during these past days, all of which have been without the intention of interfering with the good performance of my national team, the truth is that my colleague Giorgio Chillieni suffered the physical result of a bite in the collision he suffered with me. 'For this: - I deeply regret what occurred. 'I apologise to Giorgio Chiellini and the entire football family. Chiellini, who had himself called the ban "excessive", retweeted Suarez's apology on his own site and followed this with a personal show of support by accepting the apology and even stating that he hopes FIFA reduces the suspension. He sent Suarez a public message on Twitter, saying: "It's all forgotten. I hope Fifa will reduce your suspension." Meanwhile, Football pundit and former England international, Gary Lineker has suggested that Luis Suarez's apology for his biting shame at the World Cup has been made to help engineer a move to Barcelona. Barcelona reportedly remain keen on signing the troubled Liverpool forward - with reports claiming the La Liga club would want him to publicly apologise for the incident first. After initially denying responsibility for his actions, claiming he had merely collided with the Italian defender, Suarez finally apologised to Chiellini on Monday.